This year’s RoundUp is February 23th from 1:30 pm to 9:30pm. Please arrive by 5 PM so you can vote for the new board! RoundUp is our official annual meeting open to all Songmakers members. It includes an afternoon concert, board elections, potluck dinner and jamming. The 17 Songmakers board members are the people who plan and make our events successful. Board members attend our quarterly 2-5 PM Sunday meetings in Encino (but if you need to miss one, it’s OK), and serve for two years. There are some spots available this year so if you’d like to be on the board and help lead your club, please contact our elections chair, Simon Lucas, at elections@Songmakers.org. 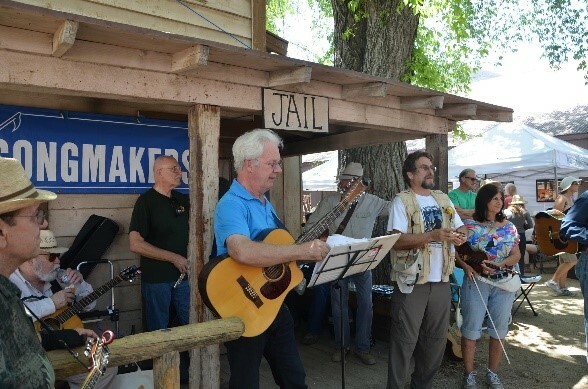 RoundUp is a chance to meet and play with the talented people who attend all of our hoots and song circles, and perform for the whole club through our Songmakers sound system! The afternoon concert this year will be under 3 hrs so we can spend more time eating, jamming and socializing. The signup list will be out at 1:30 so you can ensure a spot in the concert. There will be at least 2 satellite rooms for jamming or practicing while we setup for the 2 PM concert and 6 PM potluck. Participants may sign up for one song. The last ten slots will be reserved for Hoots or Song Circles, and every 4th slot will be a sing along, so if you sign up for one of those slots make sure to perform a song we mostly know or you can teach. If your membership is not up to date, you may pay your dues at the membership table when you vote from 1:30-5 PM. In addition to the great entertainment at the concert, there will be a table where you can buy, sell, or donate music related items such as instruments, sheet music, kazoos, etc. Please provide your own signs with names and prices. After the concert, we will have announcements, awards and announce the election results, followed by a fabulous potluck dinner! Songmakers board members will provide desserts and the club will provide beverages, so please make your contribution a main course or side dish for 10-12 people. Please use disposable containers, if possible. After dinner, we’ll clear the tables and jam until around 9:30pm. There should be at least three areas for jamming, the main hall and two side rooms. If you have any questions, please call Andy Gelencser at 909-596-1266 or email roundup@Songmakers.org.